The iFPX series has been discontinued. You can contact our Sales Department to check on any remaining stock. The OMEGA™ iFPX Internet Counter puts “dumb” data on the World Wide Web. This revolutionary technology transmits virtually any conventional counting application up to 500 KHz over an Ethernet network or the Internet. 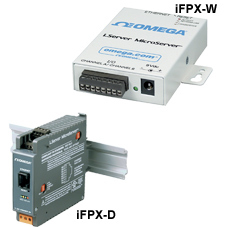 The OMEGA iFPX (Internet Frequency Pulse Transmitter) can count contacts from the simplest button or switch, as well as count pulses from most any conventional transducer such as a proximity sensor or quadrature encoder. The iFPX converts raw data to intelligent information. The iFPX can be configured as a virtual version of most any Rate/Frequency Meter, Totalizer, or Batch Controller. It is a node on an Ethernet network with a unique IP address and serves the data to any authorized computer on a LAN, WAN or the Internet. Set points can be programmed to trigger an alarm and even send email automatically to a Web-enabled cell phone. No special software or drivers are required. A user can type the unit’s IP address (or assigned name) on the address line of a Web Browser such as Internet Explorer. The device then serves actual JAVA based active Web pages that present the information numerically and graphically. The iFPX supports the common Ethernet/Internet Protocols: TCP, UDP, ARP, Telnet, DHCP, DNS, and HTTP. The device integrates seamlessly with data acquisition and industrial automation programs. The iFPX offers password protection for security. The OMEGA iFPX provides two (2) discrete input/output channels. For applications that use two inputs, it can perform calculations with the data from channels A and B that can be presented numerically or graphically, such as charting position on an XY graph. The OMEGA iFPX is offered as a PC board for OEM applications, and as a stand-alone device suitable for industrial or commercial applications. OMEGA iServer products are designed and manufactured in the U.S.A..
Output A and B: Open-collector transistors, rated 150mA sink, 30V. For external supply. Safety Qualified ac/dc power adapter with 9Vdc @ 0.5A min, included.